Been thinking a lot about photomontage and what I might put into one with the kinds of photos I like to take. My teacher, Carol Leigh, has started a new blog that I highly recommend browsing regularly if you're a frustrated artist like me. Even if you're not! I made this photomontage from the very corner of a photo of Mexican pots I saw while roaming the streets of San Diego with my friend Judy. I never noticed the great bench silhouette in the background until the pots photomontage basically was crap. Added a few other bits to ground the photo. The wall medallion was already on the wall. Oh yeah, one more thing. Moss! A photo of sidewalk moss I made (we grow it for fun here in Oregon), then copied, then inverted colorwise, then blended made the cool colors and textures. Oooh! Aaah! Very rich colors in this piece, and the silhouette of the bench helps emphasize the colors. I love it. Thank you, Judy. I think it was the moss layer that made the colors look so good, LOL. 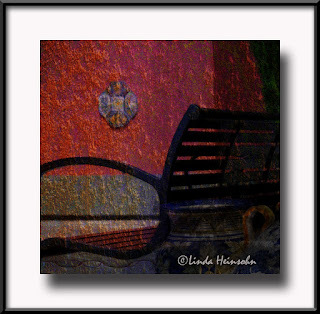 Carol, I agree it is too dark, though I was so surprised by finding the bench shadow in what was to be a pottery photomontage that I just went with it and left it this way. I think, due to cropping, there are too few pixels in this to seriously make it worth extra work. But doing this was worth it for inspiration value! Perhaps it's a meditation space for Darth Vader! Ha!